from All Is Well to our Spring Stashbust celebration. Theresa has a fun blog with a great name (mommies out there do you feel me on this one?) She has amazing Anthro knock-off skills and can bake a cake like no ones business (putting my little skills to shame, but hey). 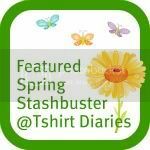 #1 – I decided to sign up for the Spring Stashbust because I love myself an upcycled project! What’s better than taking something you no longer use and transforming it into something even better? And…I may just have a stash or two that needs some busting! #2 – My favourite upcycled project is by far my anthro-inspired necklace…upcycled from an old woolen sweater and a cast-off necklace. #4 – I blog as a creative outlet…both in terms of the DIY projects I tackle and the writing process. 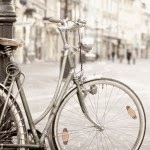 I also blog to make connections with others who share my interests. #5 – I find a lot of inspiration in catalogues…such as Pottery Barn and Restoration Hardware. I love to visit home-decorating stores and dream up ways to create what I’ve seen. Of course Blogland is also full of inspiration! #6 – I have a second blog…www.justcakesandmore.blogspot.com where I share my edible creations! So What Did Theresa Do?